Health Care Reform Cheat Sheet #2: Just Vote Already! Anyone else tired of this nonsense? The name-calling, the endless talking, the procedural hang-ups - all of it! 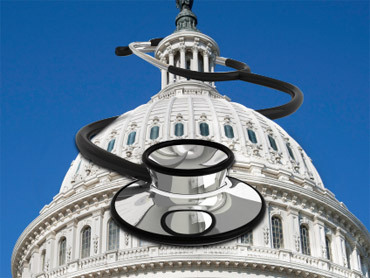 Yes, I appreciate the process and all, but health care reform has been tortuous. Hey, all of you poor, overworked legislators - JUST VOTE ALREADY! I remember when an Early Show producer said to me, "I don't know how we're going to do this, but we have to make the health care debate seem interesting and easy to digest." Fat chance! The best I could do was create a health care reform cheat sheet, which at the time only reflected the House health care bill. •Tanners are screwed: I love this particular addition to the Senate version because the plastic surgeons say that everyone agrees that tanning is bad for you, while imposing extra charges for elective plastic surgical procedures (the so-called "Bo-tax") would be unfair, because we all know that nose jobs are very good for you. •No public plan: Although the pain is felt loud and clear by my fellow bloggers at HuffPo, it's obvious that there will be no government plan to compete with private insurers. Blame/credit for the vaporization of the public plan goes to CT Senator Joe Lieberman, aka the crankiest man in DC. •Abortion: Senate plan requires people who receive subsidies to make two separate monthly premium payments: one for all insurance coverage except abortion and one for abortion coverage. Nebraska Senator Ben Nelson believes that if a woman had to write two checks, she may not choose to have an abortion. •Paying for Health Care: Here's where things could get interesting in the House-Senate reconciliation process. Both plans rely on Medicare cuts, taxes on industry and employer mandates to raise some cash. But there's a big difference between the two plans when it comes to funding the other half of the nearly trillion dollar cost. •The Senate plan would tax "Cadillac Plans" (those that provide more than $8,500 for individual coverage and $23,000 for families) and would increase Medicare payroll tax to 2.35% from 1.45% for couples with AGI of more than $250,000 and individuals over $200,000. Usually I'm eager for Christmas Eve day because it means a happy family time filled with lots of delicious food is near. This year, there's an extra bonus: I'm that much closer to writing the final version of the health care cheat sheet! •Does Senate Health Plan Hurt Retirees?